As a way for the Center for Faith & Culture to prepare for this conference, and to begin addressing the question of public faith in a pluralistic world, we came up with the idea of doing a series of lectures on the topic “Theology Live.” This series of lectures offered us opportunities to engage with and learn from leaders in diverse fields who have “gone live” with their ideas, endeavoring to engage and shape the broader public with a voice rooted in and informed by faith. 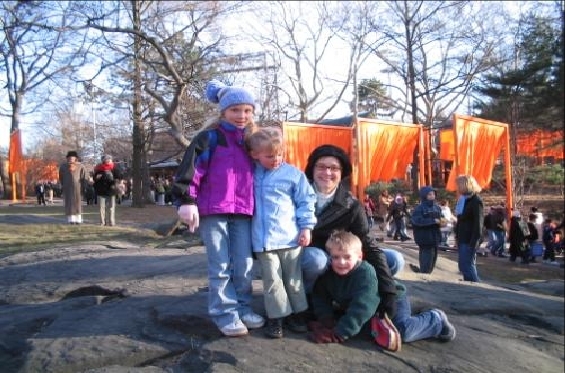 In the midst of this series of “Theology Live” lectures last winter, my family and I went down to New York City to walk through the spectacle public art display of Christo and his wife, Jeanne-claude. The exhibit was a display of 7500 tall gates with half curtains hanging down on all the walkways of Manhattan’s Central Park. Almost as if they were blood running through the veins of the park, and following that image, the gates brought out throngs of people into the cold midwinter so that the walkways were literally full of life. The experience of The Gates in the midst of our deliberation on public art and the question of public faith led me to attend to such spectacles more readily that I might have previously. Two concurrent art events touring the world at the moment pick up this theme of art done outside the studio, and each intertwine with the theme of our conference. The first is “COEXISTENCE”A giant outdoor poster exhibition sponsored by The Museum on the Seam in Jersusalem. The museum’s name seems odd in its abbreviated form, but takes on a distinctive power when spelled out fully: The Museum on the Seam between war and peace, between distress and well-being, between religious faith and secularism, between reality and hope, between you and me. Founded in the late 1990s, Curator/Director, Raphie Etgar, wanted to create a distinctive exhibit for the museum to embody its mission. 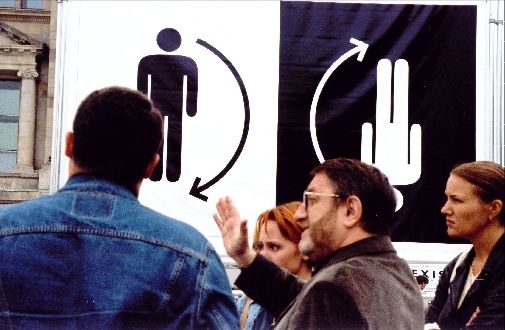 He wanted a visual message that would make a contribution to the way we think about and treat the "other" in our societies. The message had to be universal and created by an international group of artists and it had to reach as large an audience as possible. 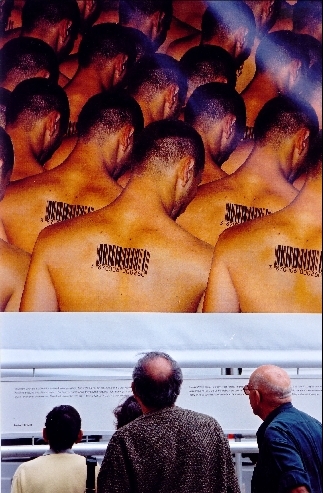 24 international artists accepted the invitation to create posters and their opening display in the streets of Jerusalem created a great public stir. The giant and striking images have a great impact on visitors and passers-by and make a contribution to the dialogue in our communities about the “other”. In today’s global world, our societies are changing and adapting to new realities. We are learning to live with differences and to respect our neighbors. It is not always easy and we do not always succeed but we must continue to try and confront our misunderstandings and prejudices. One image in particular has taken on a life of its own because of its iconic power and the particularly troublesome prejudices and misunderstandings its imagery points toward. 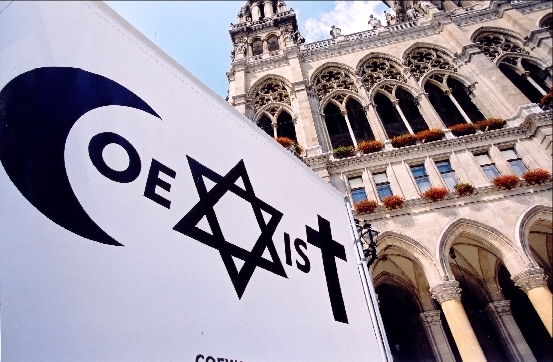 Created by the Polish artist Piotr Mlodozeniec, this icon consists of stringing together of three religious icons representing the three Abrahamic faiths (Islam, Judaism, and Christianity) to spell out the word "coexist." While most of the images don’t lend themselves to easily to graffiti, this does and it has become an increasingly common sight silk-screened on tshirts and spraypainted on walls. 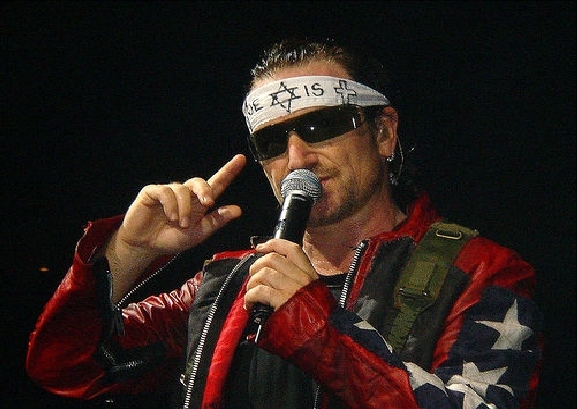 That, in fact, is how Bono, the activist singer of the Grammy-award winning Irish rock band U2 first saw the sign. Their use of this icon in concert provides the second public art event I’d like to share. The band, drawing on Christian themes, have always struggled to seek the means to fight the sectarian violence of their homeland. One of their most famous songs, 1983’s Sunday, Bloody Sunday, contrasts the horrible violence of an IRA Sunday morning bombing in Derry, Ireland, in 1972 with the cross and resurrection of Jesus Christ, moment they interpret as God’s final victory over the violence and sin of the world. 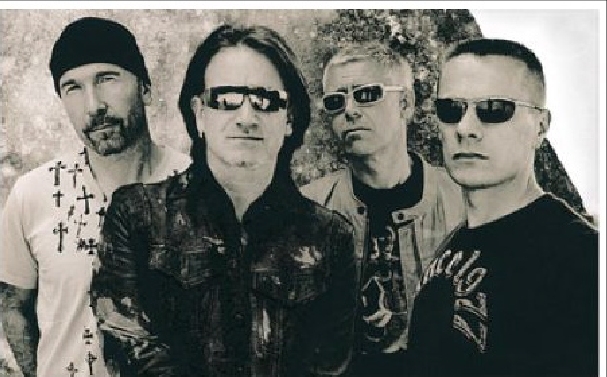 After the violence of September 11th, 2001, the band realized that the Sunday Bloody Sunday was a song not just about Ireland, but about religious and political violence. 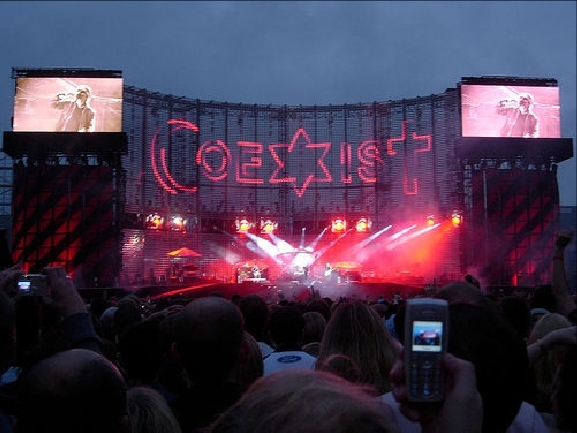 As they planned their 2004 record and tour, the Coexist icon became a crucial element of one of the most emotional and memorable portions of their live show, sold out across North America, Europe, and on track to be one of the biggest tours ever in music history. "Jesus, Jew, Muhammad, it's true...All sons of Abraham. Father Abraham, speak to your sons. Tell them, No more violence, no more fighting, no more bombs, and then leads the crowd in a chant of No More! No More!" In the European shows, which were all outdoors in stadiums that seat 60-80 thousand people, the CoeXisT sign dominates the giant screen behind the band as they sing this song. The thread here leading through these three public art projects is that Christo, the Museum on the Seam, and U2 create community through doing their art in a big way, in a public way, facing out towards the world. While Christo and the Museum on the Seam don't explicitly claim any faith-inspired motivation, as U2 clearly does, they all embody something that the religious organizations don’t often do—seek to create community through doing something accessible, thoughtful, and lovely out in and for the sake of the world. Too often, we do our art and our academic conferences inside, for our own sake, and flirt with the temptation to forsake the world for the safety of our 'studio.' What if, as Mako Fujimura argues, we follow Christo, The Museum on the Seam, and U2 in believing that the world is the greater and more significant studio or stage, and more importantly, to see that our visions of faith can directly affect landscapes and cities for the good of all. Amen. These ideas are on my mind often. I believe the public is staving for visual work that speaks without pretense, addressing basic human desires, needs..
Do you know Tim Hawkinson's work? For a FALSE "peace" fix.